La cheatsheet de FontAwesome 5 n’étant pas à jour, j’ai créé un gist pour référencer les icones en version Gratuite ou Pro. Je publie aujourd’hui un helper PHP qui permet de dessiner des séparateurs en SVG très facilement avec quelques paramètres. When you publish a game to the Google play store, the AppStore and so on, you face the boring wall of icons, splashcreens and screenshots sizes. 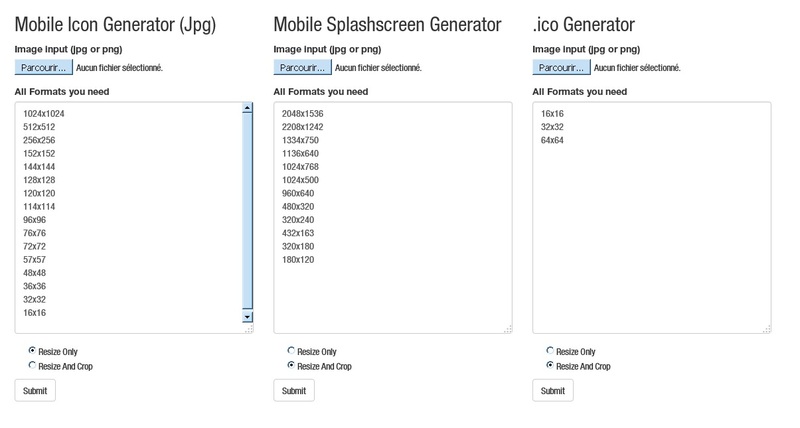 You need to generate a lots of differents images for each platform you target and that can be a huge waste of time. I didn’t found any service letting you generate the exact sizes you need, so I made my own. Here is MobileIconGenerator hosted service. And here is the source code on GitHub.